So drbuzzard, what do you think of 536? Hey, check out this mural I found while out "Getting Lost" for the last week. MileEater4ever, B10Dave, Bigbob1 and 3 others like this. I thought you might like it Jeff, it's an actual tank, cut off at an angel with a plate welded flat across the back. It's an actual WW2 museum in Eldred PA. I took all back roads from Millersburg Oh. to my sister place outside of Aflred Ny. 2wingdoc05 and GAS GUY like this. 777 would be appropriate for you, Jim. turbojim and drbuzzard like this. 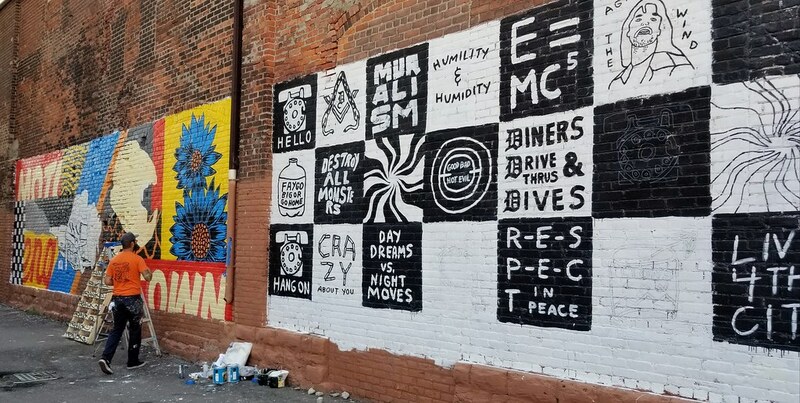 A glimpse of the official Murals in the Market abstract street scene. Artists on the job. Works in progress. And a stroll through the artists official headquarters. drbuzzard, Bigbob1, B10Dave and 3 others like this. At least I made it out to one trials event this year. Actually, one event in over two years. The 17-year-old Gas Gas ran well at the Whitmore Lake event on the 16th of September. I'm glad it was dry though, cause the 17-year-old tires probably would have lacked traction. I really need to spoon some new tires on the old machine real soon. Despite the heat and humidity, it felt good to be back out there riding over logs and rocks. It's been so long, but after about 30 sections, the bike started to feel natural beneath me as I negotiated the obstacles. Maybe next year I'll manage to make it out to 2 events. And yes, I'm still stuffing the Gas Gas into my 17-year-old mini-van. drbuzzard, B10Dave, Utrider1 and 2 others like this. While I had a hand-written set of adventurous directions stuffed into my clear map pouch, that I was originally intending on following down through the northern end of Daniel Boone National Forest to Slade, the rain had forced me to cover my tankbag, which ultimately thwarted that idea. So instead, I just punched in a "Go-To" the Natural Bridge Campground. Scott would likely be there before me. This would be our base camp for the ride-outs. We had preregistered our spot. Scott talked to the camp host and he was kind enough to suggest the perfect spot, at the very back of the grounds, which snuggled up against the wood line and a babbling brook. That brook would have Scott sleeping like a baby all weekend; the apple Jim Beam on the rocks probably helped immensely. - Scott's adventure camper and Super Duty rig. Scott never hit any rain on the way down, as he was ahead it. And it was fair weather in Slade. We also had many hours of daylight to burn. So, after settling in, we decided to head in a eastern direction on the KAT for a couple of hours. We would be focusing on the MAIN 1 section of the KAT, which is the northern-most section. There are four sections on the main loop. Just up from our camp we were able to hookup with the route. The KAT is about 60% off-road and 40% paved backroads. Our introduction to the KAT was paved. We followed narrow, twisty, hilly, and smooth asphalt for quite a while. Top-notch roads and remote. Eventually we got our first fix of dirt and gravel. We dropped down a rough and rutted gravel road into a valley. Then along a gnarly two-track with occasional standing water and some muddy area; just light mud though. Rocks were also randomly strewn about. Mostly embedded along that section. We were of course extremely excited to plunge into a few of the enticing water crossings that presented themselves. Those are non-existant up our way back home. Scott was commanding the more appropriate Husqvarna TE610, so I'd have him lead the way - and test the waters, so to speak. After a few water crossings (with no drama), we had to climb a long uphill stretch of very rough dirt road. This climb was full of rocks. Some were embedded, but many were also loose. Luckily this stretch was dry. The whole way up, I had to be sure to maintain my momentum. Also had to intensely search ahead and pick my lines cautiously, switching back and forth across the track dodging some of the more treacherous baby-head rocks and deeper ruts. Made it up and out and back onto pavement. It was a workout on the big Cam Head. Sorry I couldn't get any pictures of the rougher areas that I just described, but no way I was stopping. Shortly after, we were back on a stretch of pavement, and figured we better call it a day, and head back to camp. I'd just punch in a "Go-To" back to camp and run the most direct (fastest) route. Had to do a U-turn after blowing by this sharp looking mural on Route 11 as we passed through Beattyville. This was the Lee County Veterans Wall. Back at camp we got a fire going along with a pile of charcoal in a small grill. While I like to ride to my destinations, I'm surely not opposed to Scott dragging his palace down and setting up headquarters. Quickly, I became spoiled with all of the amenities that I'm unaccustomed to on such a journey. Scott had coolers packed with groceries and ice. He had soda and booze. I could get used to this. And once he started rattling those pots and pans - it became quickly apparent how deft of a camp chef he was, with the charbroiled burger on a toasted and buttered bun leaving me speechless. All the fixins too. With the hot and humid weather we were experiencing, the niceties were much appreciated. Condensation quickly formed on the outside of my steel hobo cup from the ice. What an incredible day. drbuzzard, B10Dave, Utrider1 and 3 others like this. That looks like the perfect get away, especially during the hot weather! And Scott is way happy with the Husky! Perhaps we'll get another great fall ride in this year again! drbuzzard and GAS GUY like this. Maybe Southern Ohio this weekend if the weather is good. On the ST's. drbuzzard and Bigbob1 like this. I always find it interesting how quickly our mind/bodies are able to adjust from 600 lb adventure touring bikes, to 200 lb dirt bikes and back so easily. As a former Motocross and Desert racer, I was always in awe of the Trials guys. The balance and throttle/clutch control is so amazing to watch. Our first morning at basecamp and Scott whipped us up a wonderful breakfast of eggs, fried potatoes, and sausage. Beats the usual oatmeal and a handful of almonds that I would have most likely eaten - had I been camping strictly off the bike. Then we topped our water supply and headed off, onto the KAT. On this first full day we would head north and west in a counter-clockwise direction from our camp in Slade. The initial stretch was on pavement and we were quickly presented with a very interesting treat. The Nada Tunnel. This tunnel is not far from Slade at all - as your heading into the Red River Gorge area of Daniel Boone National Forest. It was obvious to me that Scott was really inspired by this unique 900 foot long tunnel. It's a rough cut keyhole through the layers of rock formation or outcropping. A really cool way to start out the days ride. The tunnel allows two-way traffic but is only 13' high by 12' wide, so can only support one vehicle at a time, making it imperative that you watch out for headlights and make sure the coast is clear before entering. - After entering, we stopped side-by-side while flipping our high beams on in order to brightly illuminate the tunnel so as to get a good picture showing how jagged and primitive the tunnel walls are to this day. - At the far end of the tunnel, we discovered automobile tire tracks right to the edge of the wall ... and tell-tale paint from the body smeared along the damp, dark, and rocky wall. The Nada Tunnel was constructed during the early 1900's when logging was a major industry in order to access the abundant natural resources of the Red River Gorge. A railroad bed used to run through this tunnel, which was used to transport the logs to the sawmill in Nada. 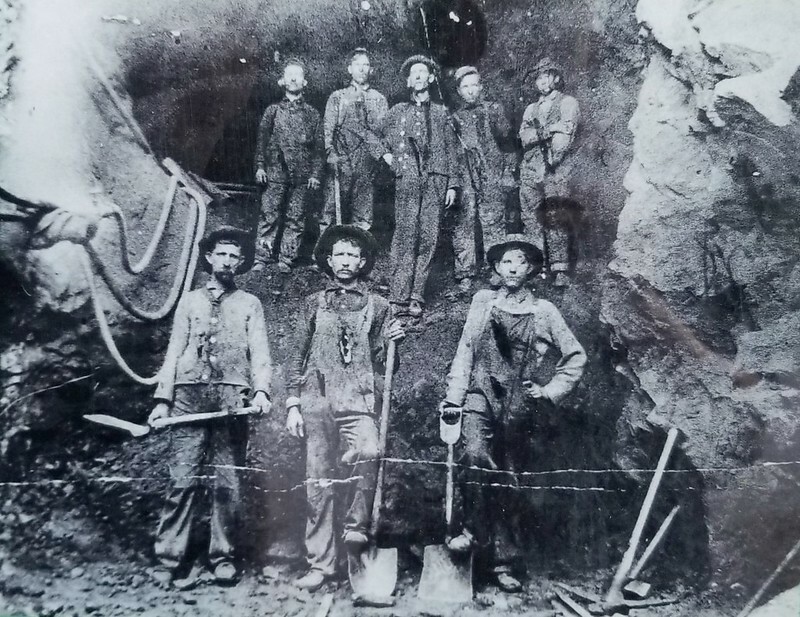 Dynamite, steam drills, and hand tools were used to dig the tunnel from December 1910 to September 1911. One man died during the tunnel construction when he placed frozen dynamite to thaw near a fire. - No fat on them boys ! The Dana Lumber Company was creative in rearranging the letters from "Dana" in naming the tunnel "Nada". The largest logging operation in Red River Gorge history occurred between 1914 and 1920. The virgin forest consisted of poplar, cucumber, ash, walnut, hemlock, yellow pine, chestnut, oak, and maple. - Scott was so captivated by this tunnel that on our last night in Kentucky, after dinner, he wanted to ride back out there for another visit. Here he is reading the history. Utrider1, drbuzzard, 2wingdoc05 and 3 others like this. Not too far from the NADA tunnel, the KAT transitioned into dirt and gravel. Along one particular stretch, an old Kentucky homestead stood out and caught my attention as we passed along side of it. It was a modest house with a small yard that was situated in close proximity to the road and backed up to the forest's edge. On one side of the yard were three above ground burial tombs, all lined up in a row. On the other side of the yard was a traditional water wishing well with a wooden bucket suspended by a spool of rope, all of which appeared to be in working condition. Just a few unique features that you don't often see in your travels. - Taking a break along a smooth and straight stretch of gravel. Before long, we came to a point where the KAT merged onto the Daniel Boone Backcountry Byway (DBBB). Throughout much of the main 1 (Northern) section of the KAT main loop, the KAT shares the trail with the DBBB. Under these circumstances, the trail often becomes very interesting and challenging and in our case on this ride - much of it was also waterlogged. I'm not sure what the conditions are typically, as far as water on the trails, but this has been a very rainy year in the south. - Our initial encounter with the Daniel Boone Backcountry Byway. Time to plunge in and get serious. shuckinator, B10Dave, 2wingdoc05 and 2 others like this. 2wingdoc05, turbojim, Sunday Rider and 3 others like this. I guess the waterproofing question is really irrelevant, considering it was so hot and humid that we were drenched in sweat anyway. At least I was ... wrestling that big GSA around in that terrain. The next morning back at camp, my jacket was still very wet from sweat; all the way up the sleeves to the cuffs. My boots and socks too. Nothing would dry out. Eventually, I'd strap my riding pants and jacket to the back rack and just let myself air out. Between staying damp and the dirty shower house back at camp (and I didn't pack my flip-flops) I'd acquired a nasty case of athletes foot by the time I headed home. Probably mostly the shower floor. Nothing a fresh can of tough actin' Tenactin couldn't cure after a few days of returning home. 2wingdoc05, turbojim, drbuzzard and 1 other person like this. Bigbob1 and drbuzzard like this. Of what we were able to experience during our short two days, this road (if you can actually call it that) was my favorite section of the Kentucky Adventure Tour. It was more like a creek bed at times. When we came to this little creek crossing, I instantly recognized it from another Ride Report in the spring; specifically the dropped GS in the mud, as he attempted to climb the muddy bank on the far side. I'd dismount and walk over to the muddy bank, in order to scope out my options for as clean a line as possible. My big GSA and greasy clay are not a desirable mix. Especially with half wore out Shinko 804/805's that are not very efficient in the mud from the start. The right-side looked the best. Had to take note of that partially embedded root on an angle towards the top. You can see it in the picture below. If my front tire contacts that anywhere along it's length, my front end would wash out after following and sliding along it. Instead, I chose to meet the root with my front tire at the top edge where it meets the earth and essentially forms a wedge or crook while maintaining stability and traction. Motored right up. GlennJ, 2wingdoc05, Utrider1 and 3 others like this.